Regardless of size or geographical location, aviation operators and service providers will be required to implement a Safety Management System. Civil aviation regulations, based on FAA 14 CFR Part 5, IS-BAO, ACSF and ICAO’s SMS framework, reference safety reporting as a key source of data for operational issues and the management and analysis of that data as a fundamental requirement of an SMS. 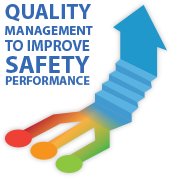 A Safety Management System is about managing risk, and without a comprehensive toolset, it is impossible to move from the historic reactive management of safety (analysis of accidents and incidents) to a required proactive approach. Both qualitative and quantitative data needs to be collected and categorized to allow effective trend analysis. There are standard reports that are mandated by authorities and regulators, such as air safety reports. However, an organization should look beyond those that are mandatory and try to report on anything that can influence their SMS or their commercial and operational strategy. Reports should be easy to use, accessible and capture all the relevant data at source. Once hazards are identified, they are managed through Risk Management. This is done by ensuring barriers are in place to prevent undesirable events from happening. The Risk Management process should be central to the SMS. The purpose of this is to enable an organization to avoid or mitigate the impact of the hazards identified through the hazard identification process.